I always enjoy being contacted by past clients to create another portrait for them. It's nice because they already know what to expect from me so there's no extra selling on my part and no great surprises for them other than what I may come up with to match their ideas. Many times they only have a few photos and rely on my expertise to fill in the blanks. They often tell me to just "work my magic". While I'd like to take credit for that "magic" I believe I always have a little extra help from the ultimate Creator who just uses me to fill in those blanks. I've been given a gift and I'm just trying to use it to bring joy to others. This recent painting was one of those that was a little shy on reference and I had to use my imagination again. Some days it really gets a good workout! The biggest challenge, or so I thought, was how to combine the colors of this red Doberman with a brown blanket with pink polka dots and some kind of background and make it all work together. My photo reference had a yellow cast to it so I really wasn't sure of exact shades of color and had to make my best guess. The dog was easy enough as there's plenty of photos of red Doberman's to look at, but the blanket? I think that's where that extra magic comes in because I often times have no way of knowing such things and somehow they just show up in my paintings. Coincidence or divine intervention? Since I'm not much of a believer in coincidence I'm guessing I have help. How else could I know these things? 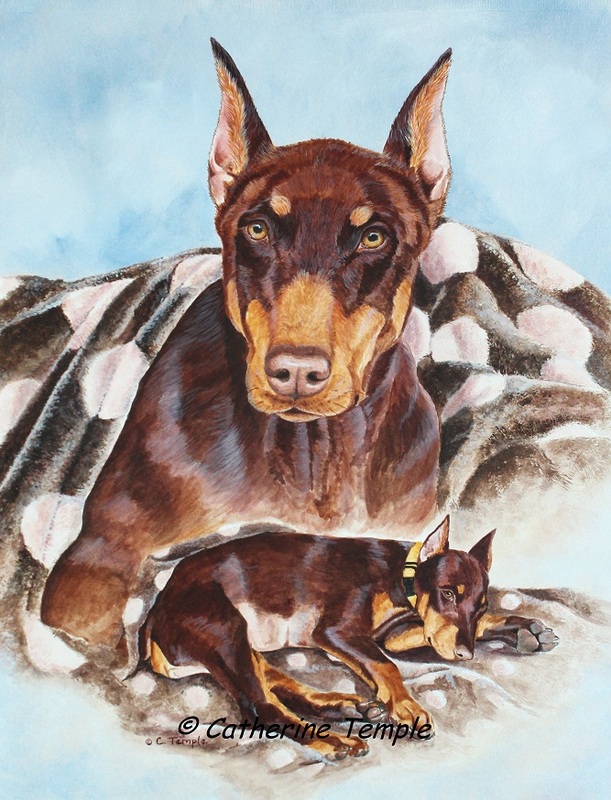 Anyway, this is a "past to present" portrait of Stormey, the red Doberman, and her favorite blanket. It was painted in acrylic. My clients have approved and I think it turned out quite well. Now.....I wonder what my next painting challenge will be?? ?